Fiscal policy structure influences the labour capital mix by introducing or removing an incentive for firms to substitute capital and labour. By plotting a ratio of capital and labour taxes and readily available statistics on unfilled job positions and gross fixed capital investments, it is possible to discern an upward trend between higher capital taxes relative to labour taxes and increased complementarity of labour and capital (as measured by the correlation of quarterly percent changes between the two variables between 1996 and Q2 2018). Relatively complementary economies such as the US, where high productivity nudges complementary investment, contrast with the Polish and Australian economy where substitution prevailed in firms’ strategies. 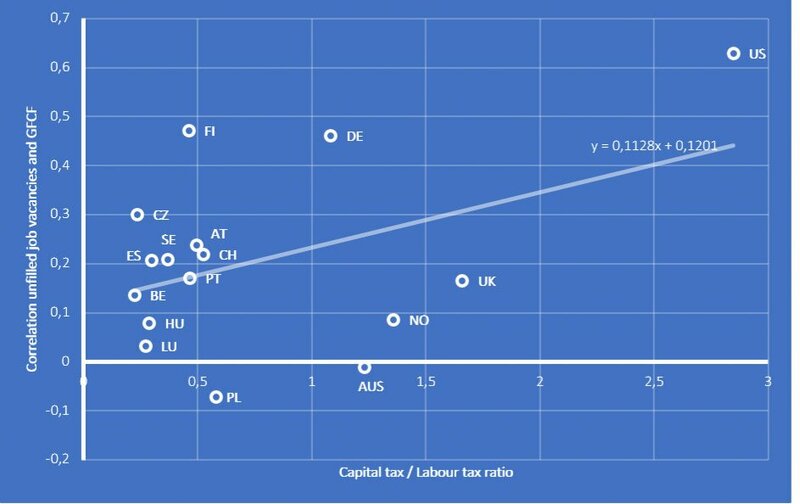 The comparison between Germany and Finland clarifies the impact of tax policy (estimated correlation .43) is limited: capital wealthy countries that afford increasing disincentives to capital intensity (in the form of taxation) incentivise labour-complementary capital formation.